Dreary weather (along with a brief bout of sickness and some major stress) have brought on a serious case of the winter blues lately. What to do to counteract it? Rest, good food, and time with the boy are reliable remedies. Another way to perk myself up is to dress myself into a better mood. Wearing bright colours, interesting accessories or lipstick always make me feel better. 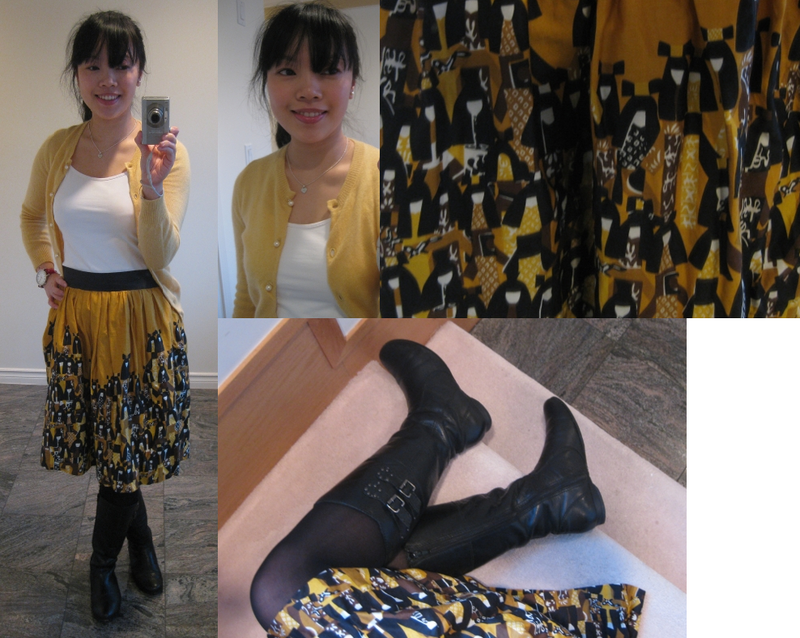 After all, with the whimsical Japanese doll print on this yellow skirt and a cashmere cardigan, how can I think anything except happy thoughts? Do you ever dress up to deliberately brighten your mood? P.S. Happy Valentine's Day! Whether you're single or you have a significant other, do something good for yourself and your skin by entering the Consonant Healthy Detox for Body kit giveaway. Really, really cute oufit! Yes sometimes when I feel really dreary I force myself to wear something bright - always does the trick! This outfit is super cute! Happy Valentine's Day to you and the boy! that is a very happy outfit for a otherwise gloomy day in vancouver (i just assume, it's always cloudy there around this time of the year). have a great valentines day with L! Such a great skirt! Anthropologie always has the most darling items. Hi Lisa!! How was your Valentine's Day :) Hubs and I stayed in and ordered sushi! About your outfit - I really like the Anthro skirt - aren't you excited to hear that they're coming to Vancouver? YAY! I read somewhere that one should try and wear a bright outfit on a Monday, and when I remember to do so, I find it brightens my mood! please come and visit me sometime!! love the sunny colours! and envious that you can wear yellow. Think we should campaign to have Anthropoligie to open a store in Van. Teresa, haven't you heard? Anthropologie's opening a store on South Granville where the Urban Planet used to be!